Pratik Rayamajhi/Republica Lohani (Third from right) at the press meet organized in the capital for the declaration of his Ekikrit Rastriya Prajatantra Party (Rastrabadi) on Wednesday. 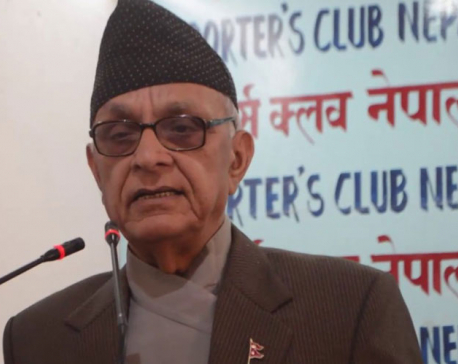 KATHMANDU, March 29: Veteran leader and ardent royalist Prakash Chandra Lohani has announced a new party under his leadership on Wednesday, just weeks after he resigned from the newly-unified Rastriya Prajatantra Party. The new party has been named Ekikrit Rastriya Prajatantra Party Rastrabadi. 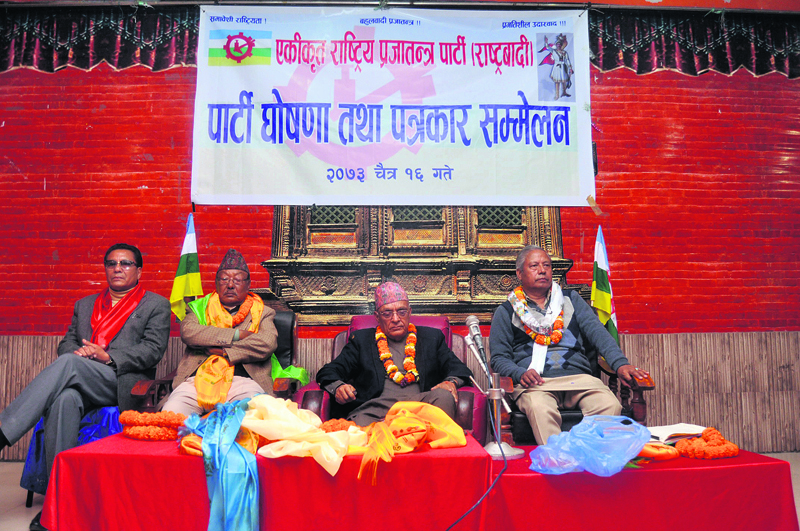 Lohani had quit the RPP shortly after the general convention of the unified party following a bitter row with party chair Kamal Thapa over the party's election symbol. Going against Lohani's demand to retain plow as the election symbol of the unified party, party chair Kamal Thapa had unilaterally picked cow as the party's election symbol. Keshar Bahadur Bista, another advocate of monarchy who was previously with the Rastriya Prajatantra Party-Nepal led by Kamal Thapa, has been named senior leader of the party. The new party will have a 71-member central committee. Addressing function organized to announce the new party, Lohani presented his party as true friend of the people. He said that the new party would work to eliminate poverty, unemployment, corruption and economic downturn. During the function, the party unveiled a 20-point manifesto that among other things seeks to restore monarchy and Hindu state. 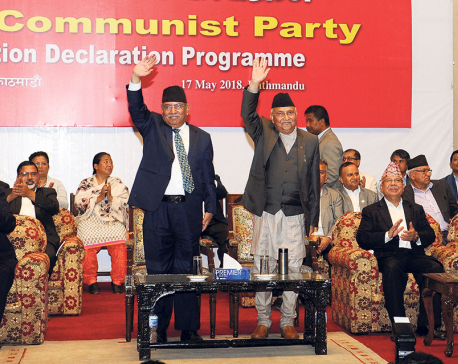 The manifesto states that constitutional monarchy would work as a pillar for unity and harmony among Nepalis.